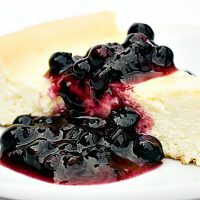 A classic, never fail and universally loved dessert, this Classic Cheesecake with Blueberry Sauce is a great one to have in your baking arsenal. I’ve always believed if I’m going to invest time and ingredients in a special dessert, I’m going to go all in. This cheesecake has almost 4 packages of cream cheese in it. Not for the faint of heart :) And since wild Ontario blueberries are in season right now, I knew only they would be befitting of this special cheesecake. And let me tell you … it was all so worth it! I’m lucky enough to live very close to where wild blueberries are plentiful. Even so, they are not cheap – $11 for a scant quart box, but worth every penny. If you’ve never had a wild blueberry, I can only tell you they are miles away from the large, cultivated ones. 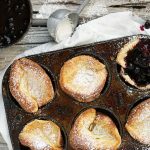 I love their petite size, the way they hold their shape through baking and of course, their intense, sweet blueberry flavour. And they apparently have more of that great antioxidant goodness than the cultivated ones, too. They are worth seeking out. Don’t worry though, if wild blueberries aren’t in season, you can use any fresh or frozen blueberry for the sauce. It will still be sinfully good. 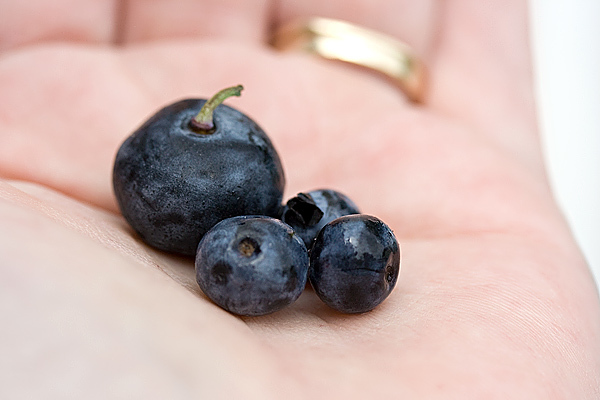 As you can see, wild blueberries are much smaller than cultivated blueberries. They are also higher in antioxidants. Wild blueberries are never planted, only harvested off low-bush plants. They are readily available year-round frozen. You can use either an 8-inch or a 10-inch springform pan for the cheesecake. Obviously, the thickness of the finished can and the cooking time will differ. Look for wild blueberries in with the frozen fruit, where they are both much less expensive and available year round! This cheesecake only gets better with some time spent in the refrigerator. I would suggest at least 4 hours in the fridge before serving or even longer, if you have the time. If wild blueberries aren't available, feel free to use any fresh or frozen blueberry for the sauce. Pre-heat your oven to 350° F. Butter the bottom and sides on an 8-inch spring form pan. 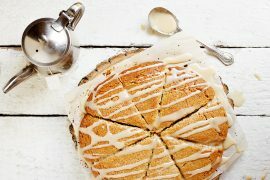 You can use a 10-inch but the cake will be thinner. 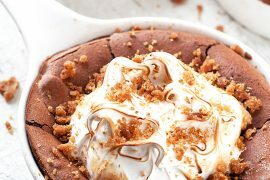 Take the graham cracker crumbs and sprinkle evenly over the bottom of the pan, just so it covers the bottom of the pan without any bare spots. Place the pan in the fridge. In a large bowl (or the bowl of stand mixer), whisk together the sugar and the cornstarch. Beat in the cream cheese and then the egg. Slowly add in the heavy cream, beating constantly. Add the vanilla and mix well. Remove pan with cracker crumbs from the fridge. Pour this mixture into the prepared pan. Bake in the preheated 350° F. oven until the top is golden, about 40 to 45 minutes. 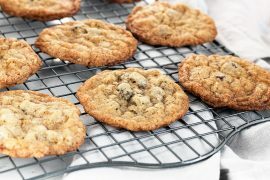 Cool in the pan on a wire rack for 3 hours at room temperature, then refrigerate, 4 hours or more. Prepare Blueberry Sauce: Combine sugar and cornstarch in small saucepan. Take 1/2 cup of the blueberries and crush with a fork. Add to the saucepan with 1/2 cup of water. Stir. Bring to a boil and cook until sauce is thickened and translucent. Remove from heat and add remaining 1 cup of blueberries. Allow to cool at room temperature. 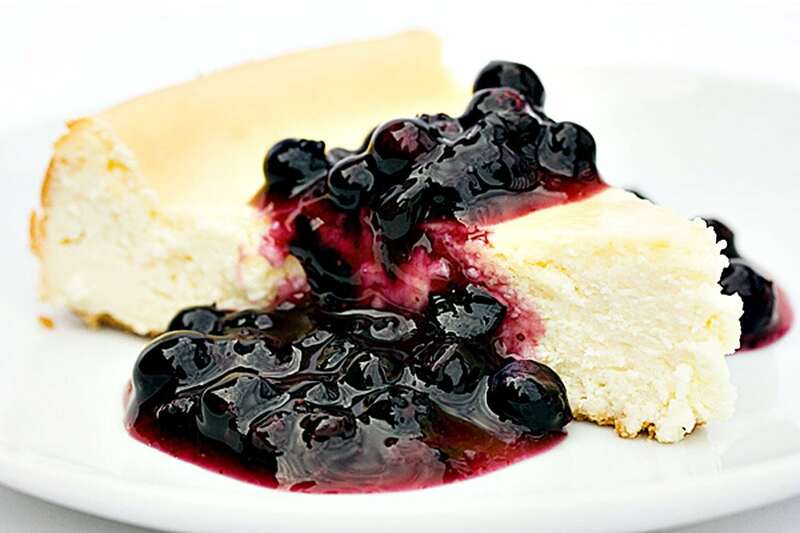 Serve cheesecake drizzled with blueberry sauce. 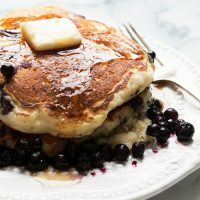 Classic, easy and delicious, these are My Best Blueberry Pancakes. 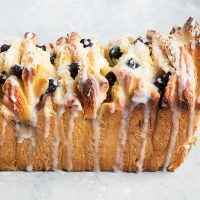 Made with pantry items, you'll never need to buy a box again! May I know how much time needed for a 10- inch spring form pan? Hi Siam, I would suggest probably 30-35 minutes for a 10-inch, but check regularly after about 25 minutes. Bake until golden and set. Thanks Betty. I think huckleberries are much like blueberries. I hope development never reaches our blueberries. Right now the only threat to them is hungry bears! Gorgeous cheesecake. Those wild blueberries remind me of the wild berries we used to have growing in our area. We called them huckleberries, and they looked just like a blueberry only smaller. They were so sweet and flavorful! Unfortunately, development has eradicated most of them and it is rare to find them now. So glad you can at least have them for a price! Beautiful photos- I’ve subscribed to your feed- thanks!